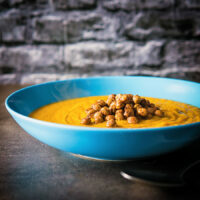 This roasted carrot soup is loaded with wonderfully spicy North African flavours and is topped with crispy sumac coated chickpeas! 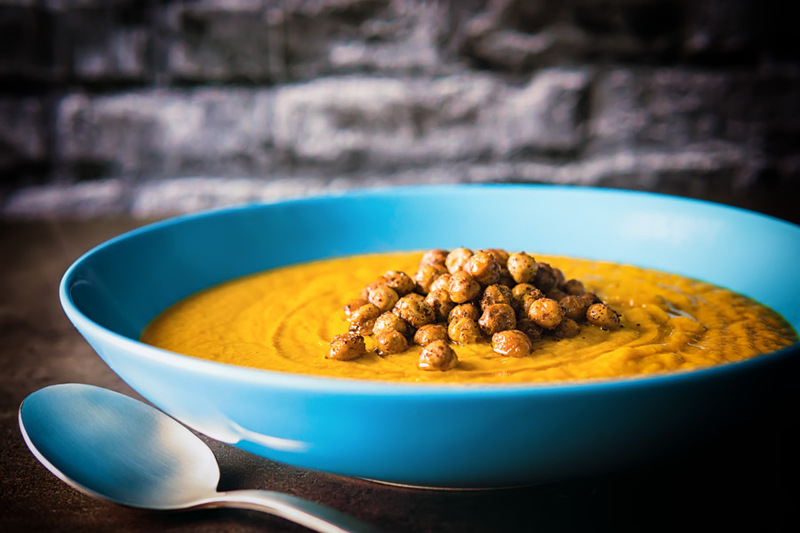 Harissa Roasted Carrot Soup With Crispy Chickpeas. 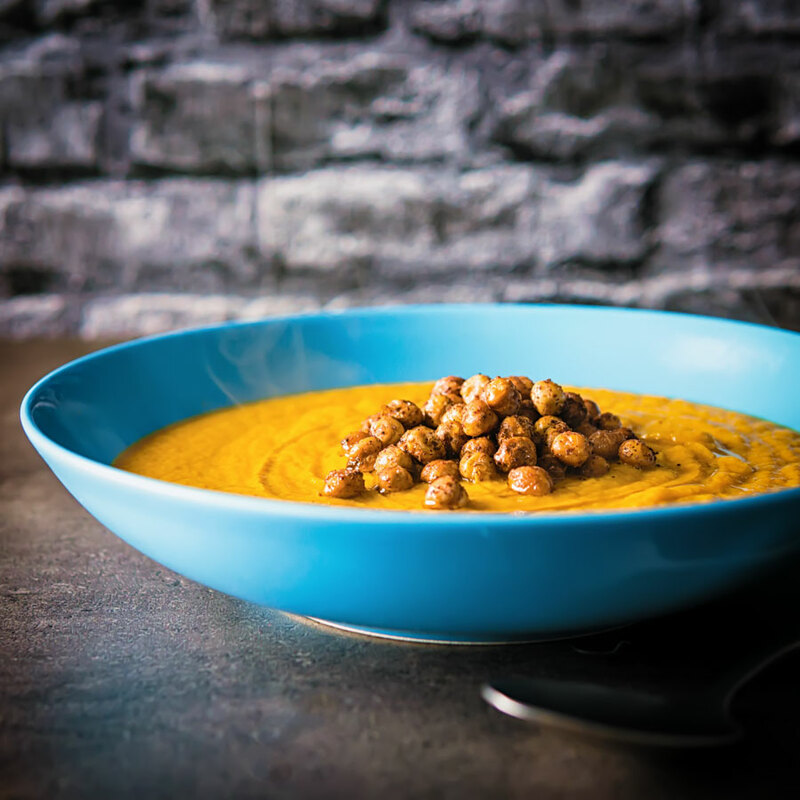 They work particularly well with the sweet and earthy tones of carrot… Hence this soup! 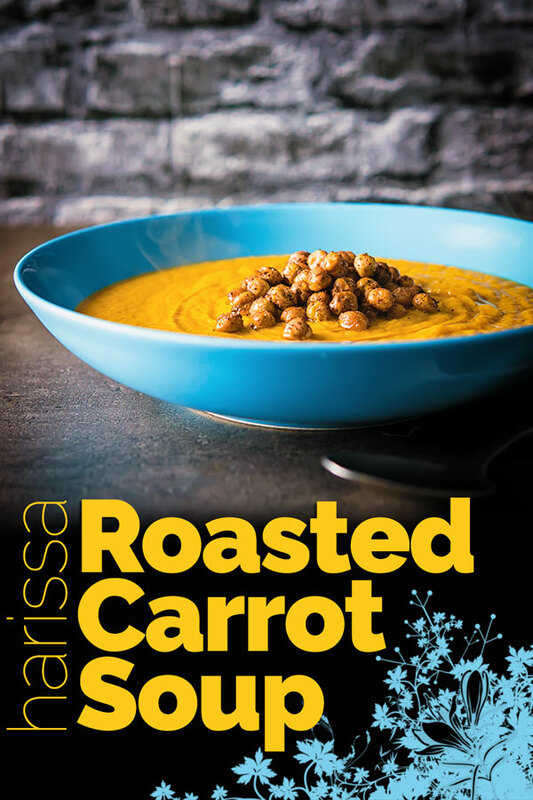 In many ways, this easy carrot soup has a lot in common with my roasted curry parsnip soup. Roasting the carrots intensifies their flavour and sweetness and roasting the harissa does something very similar. 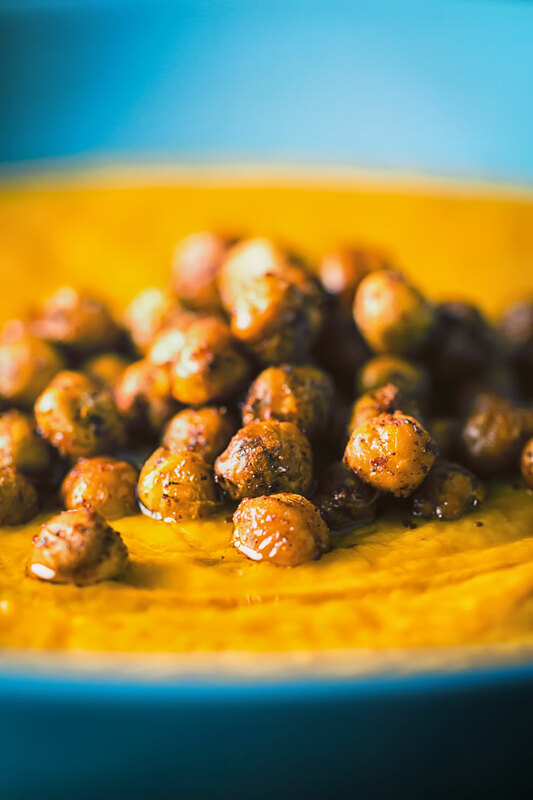 The crispy chickpeas are the perfect ‘crouton’ substitute in this recipe and are much more in keeping with the North African flavours. Not that I have anything against croutons of course! But the bread croutons I love and use for instance in my Tomato Soup Just feel wrong in this recipe. You can roast the chickpeas if you wish but they will not stay as crispy as the would if fried. As with most soup recipes, it is perfectly fine to make up this soup in advance and reheat. It also freezes wonderfully well and can be scaled up as much as you like. This recipe serves two as a very generous ‘main’ but can be served as an appetiser or a lunch for 4 people. I have also just noticed it is vegan, well there we go a vegan soup from little old me and completely by accident! I have a well-documented love affair with soup! Any time of year for practically any meal soup is capable of ticking all the boxes. This easy carrot soup falls firmly in the simple category. All you need to do is roast your vegetables then blend with a good stock and job done. One spicy, filling and complexly flavoured soup with almost no effort. Just like my Broccoli and Stilton soup and my Roasted Butternut squash soup, this recipe is a blended soup. That does, of course, mean an extra step and more washing up. I have a suggestion for that though, we have a simple rule in our household! The cook never washes up, you are welcome! Fusion food is often misrepresented and misunderstood, at its heart, it is just a recipe that brings together multiple influences. To be honest most of what we eat has multiple influences. This soup represents a whole range of the food influences I have been exposed too. The texture is similar to a Hungarian Főzelék a very ‘rustic’ simple this vegetable soup. The flavours are straight out of every North African playbook of recipes. Yet the very idea of a Carrot soup or indeed any root vegetable soup is very British. It all just works wonderfully well and all thanks to global food influences! Mix together the olive oil, harissa paste, zaatar, salt, and pepper. Top and tail the carrots, peel and cut the onion into wedges then place on a baking sheet. Coat the carrot, onion and garlic with the harissa and olive oil mix then roast in the oven at 200°C or 400°F for an hour. Heat some oil around 1cm deep in a pan. Make sure the chickpeas are dry and then fry the chickpeas for 4-5 minutes until crispy. Remove the chickpeas and place on kitchen roll and season with sumac and a little salt to taste. Remove the vegetables from the oven and place in a blender along with the vegetable stock and blend. Pass through a fine sieve and the serve with a drizzle of olive oil and then the fried chickpeas. If frying chickpeas is not for you then you can roast them, they will not retain their crispiness as well. However chuck them in the oven coated with oil for 30 minutes and give them a stir every 10 minutes or so. As a huge soup lover I can’t get enough of clean eating soup inspirations. 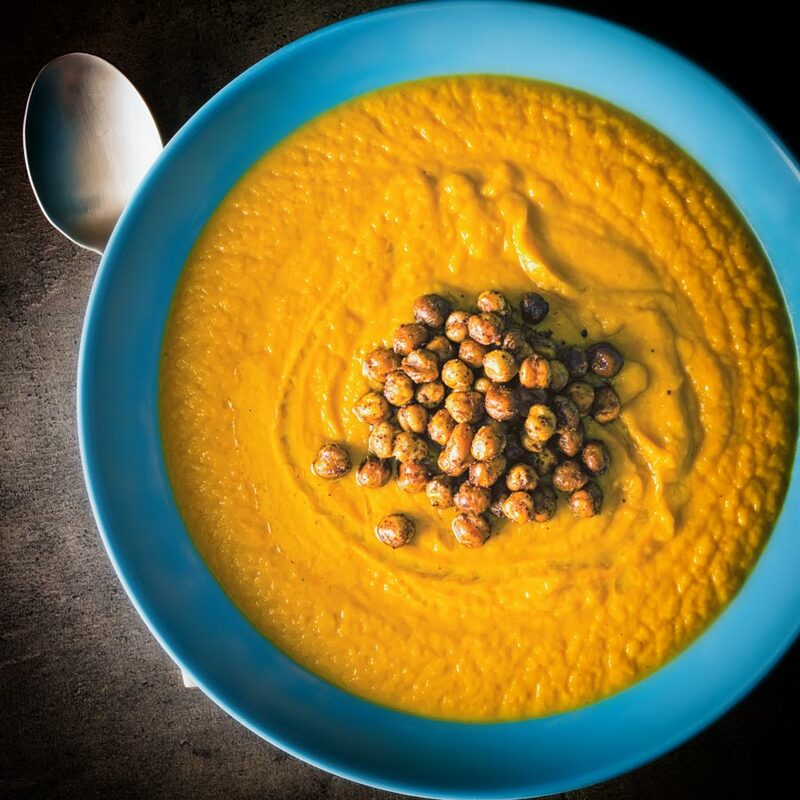 Thank you for sharing this African inspired carrot soup, bringing back wonderful holiday memories. I love especially the fact that you’ve use my beloved, protein and fiber rich chickpeas instead of bread croutons. I love using harissa in my cooking, it adds such an amazing flavour! I’m a fan of carrot soup. The added chickpeas make it even better. Ahhhh! Chickpea croutons! You Sir, are a genius!!! I love harissa on everything. I have never thought to put it in a soup – great idea. It works really will with the roasted carrots.